I believe my only complaint regarding west coast death metal act Shroud of the Heretic and their 2014 full length Revelations in Alchemy was the cover. Given the cavernous nature and the occult themes which run like imps through that record, I personally felt the white cover did not match the aesthetic of the record. It is a small complaint but something which stuck with me considering how much I enjoyed the record. 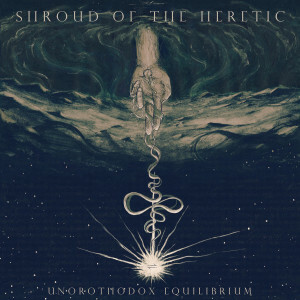 Imagine my surprise when the band’s new record, Unorthodox Equilibrium comes with a gorgeous cover with a bunch of symbolism that I probably have no business trying to figure out. It is this type of alignment which makes great music shine when a pleasing album cover and competent death metal dances under arcane mysticism. Shroud of the Heretic has always walked a separate path which at first glance seems to be in step with everyone else. It is true that their sound is cavernous much like other current death metal bands and their lyrical approach is drenched in the occult much like everyone else. With that said, Unorthodox Equilibrium shows a band which is reveling in those two aspects and crafting their own sense of self twenty miles beneath the Earth’s surface. Riffs and melodies appear within songs like “Metempsychosis” but on the lower levels of a 10 minute dungeon. At 42 minutes and 4 tracks, Unorthodox Equilibrium becomes a terrifying apparition which evokes a sense of dread and inescapable horror. I do not know if an album is suppose to make me feel claustrophobic or whether or not that is a compliment but Shroud of the Heretic excels in horrible atmosphere. Things seem to be going well for the Portland based Shroud of the Heretic. Unorthodox Equilibrium comes with the generous support of Iron Bonehead. The band seems to be picking up interest with various shows including an upcoming doomy bill with bands like Worship and Loss. I can not speak to the future or how this record will fare given people’s varying tolerance for subterranean vertigo, but I can say that someone of us are laughing with trepidation which is eventually drowned out by layers of rock and soil.